The Trek Collective: Moments from Star Trek history, coming in Trek lit. Moments from Star Trek history, coming in Trek lit. For one thing, the tale takes place in what I think is a really interesting time period, namely the final year of Enterprise's five-year mission under Captain Kirk. In fact, the story actually begins on the fourth anniversary of Kirk taking command of the ship, which of course makes him pensive and anxious about what is to come after he and his crew complete the mission. The first Star Trek film alluded to some of that transition, as did Gene Roddenberry's novelization, both of which I try to be faithful to. Another element I like is that Lieutenant Sulu plays a large role in the novel. He only had limited treatment during the series, and so it was fun to get inside him, explore his motivations, and add some details to his personal life that hew to the series and yet expand on the character—and even set up some of what came later for him in some of the Trek literature. 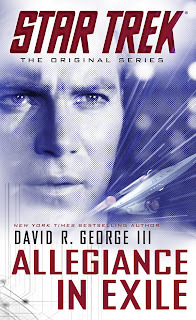 Finally, but definitely not least, I'm quite excited that Allegiance in Exile features some strong links to the later incarnations of Star Trek, in ways that I hope readers will find both unexpected and fun. I'm led to believe, from readers on the TrekBBS who have already got the book, that the those strong links include an appearance by a an adversarial race from the DS9 relaunch series - Which has rather increased my interest in this book - I await my own copy's arrival. My focus is largely on two main starship crews, which include a mix of familiar and new characters and move some of the familiar cast into new roles and responsibilities. Hopefully the new characters I’ve created are interesting and fun, and a couple will hopefully defy stereotypes in interesting ways. (Imagine a Tellarite communications officer.) There are also characters representing various branches of the Federation government, which at this stage wasn’t structured quite the same way as its 24th-century incarnation as portrayed in the book Articles of the Federation. If you’ve ever wondered what a Federation commissioner was (a title used a couple of times in the original series), you’ll find out here. There are also some surprise appearances by characters and species whose names will please the Trek trivia buffs, though in such a way that readers who don’t recognize the names will hopefully still be satisfied by their roles in the story. The Federation is still small in the number of its members at the time my book is set, but its founding worlds have just triumphed over the Romulans, and that gives them some “street cred” going in, a perception that they’re a force to be reckoned with—a reputation that comes with its own problems. Yet it’s still a fairly new, tenuous union and that leaves it vulnerable. It’s an experiment that hasn’t yet proven its success, and there are bound to be those who are rooting for it to fail—or actively trying to sabotage it. Moreover, there are disagreements within the Federation about just what its identity and priorities should be, which is why the book is subtitled A Choice of Futures. Make your way to TrekMovie to read the full interview, including discussion on Bennett's recent original novel, Only Superhuman. Meanwhile on Bennett's own blog he mentioned he has just turned in the outline for his next Star Trek novel, which (barring trade paperback or ebook additions to the 2013 schedule) will presumably will be coming in 2014. At this stage he wasn't able to provide any further details on what the book will be about.